My goodness, has it been a crazy week! We have been going non-stop between meetings, design presentations, and wrapping up some projects at my house for a big photo shoot today. Needless to say, I am ready for the weekend. I have spent the last few weekends working, but I think I may need to actually unplug and recharge my batteries this weekend. 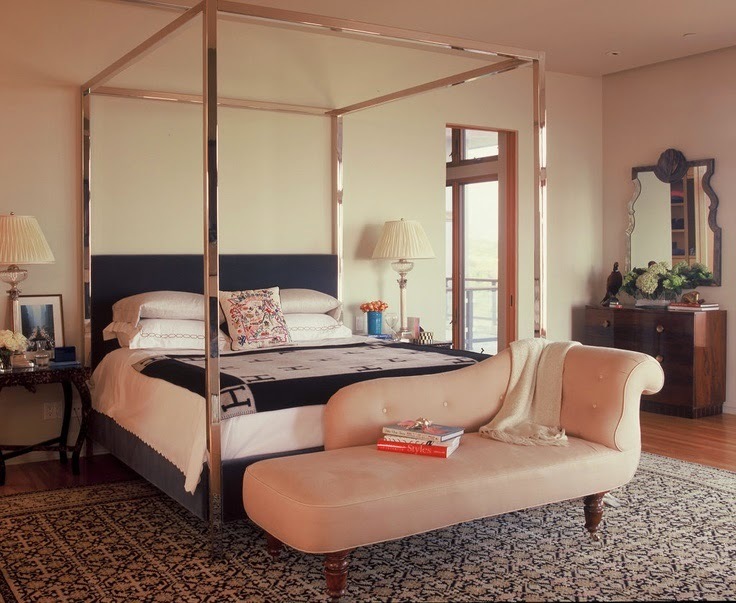 Lately, I've been really gravitating towards canopy beds as opposed to upholstered headboards and I think a high shine, polished chrome version such as this one in a bedroom by Ruthie Sommers is so chic, especially because it is paired with warmer, much more traditional pieces. The juxtaposition is so stylish. In my opinion, the bed is the star of the room, but everything else works so nicely together. The room is subtle, collected, and doesn't feel overly "designed". It looks like the perfect place to rest over the weekend! Beautiful combination of furniture in 1 room! I love the detail of the contrasting buttons on the chaise. Loving this bedroom Paloma, the chaise is delightful!